This weekend Brooke and I were in Collingwood, Ontario to visit Brooke’s parents and to see a variety show they direct every year. 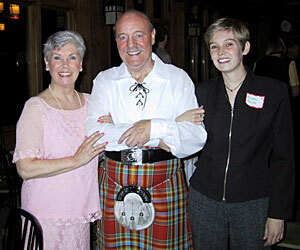 A word about my future in-laws: Jim and Phyllis Smith came to Canada from Scotland more than 40 years ago, and have been involved in community theatre for approaching 50 years. It never ceases to delight me to hear Jim’s rich voice (this year he performed “Old Man River” from Showboat) or watch Phyllis tap dance. He’s 67 years of age, survivor of both a heart attack and cancer; she’s 66. If I’m half as talented and exuberant and just plain alive at their age, I’ll be a happy man.